Today I sit having my lunch in a café in Carlton, Victoria, a suburb of Melbourne notable for its distinctive Italian influences. The café where I am writing is neither Italian nor notable, offering instead the kind of Australian ‘take away‘ food you might find in many suburbs of our cities. My lunch consisted of a salty and thoroughly forgettable chicken stir fry, served with sticky steamed rice and chased down by a passable Vittoria coffee. I am dwelling on the details because today I am in a frame of mind to notice such things, and I find that I have Italy on my mind. Perhaps my reminiscence has been partly triggered by today’s weather - an alternately sunny/overcast day with big clouds battling for dominance over deep patches of blue sky - putting me in mind of an Italian sky? Whatever the reason, I find my mind wandering back to a morning spent with friends on the Isle of Capri. 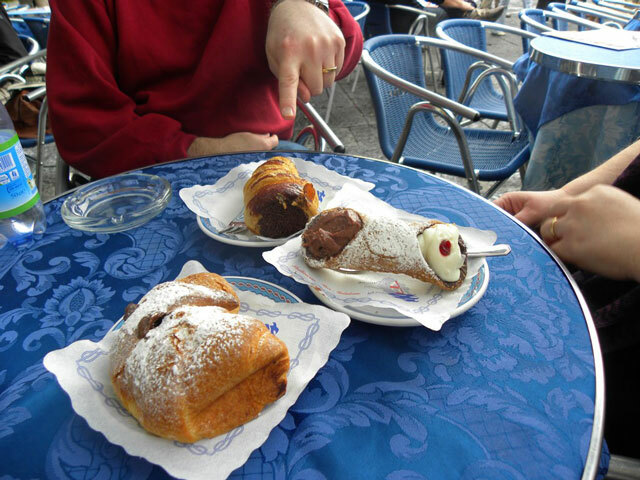 In particular I remember the blue tablecloth of such a vibrant hue that it seemed to glow, the backdrop of yet another shared round of canoli and cornetta cioccolato accompanied by excellent coffee. I remember this moment primarily because I took the photograph shown above; I took the photograph at the time because the colours were so vivid, we all thought the pastries looked so good, and all seemed well in the world. It is such a simple thing, a pastry in a café, but it is just the kind of simple pleasure that Italy does so well. Of course, what I really wanted to write about was the depths of my desire to be in Italy, a desire that is present whenever I find myself in a café, or whiling away a spare moment in idleness. I have an ache for Italy, a deep sense of the rightness of the place and a conviction of the inevitability of my returning there, despite any economic and social disadvantages it may be suffering.